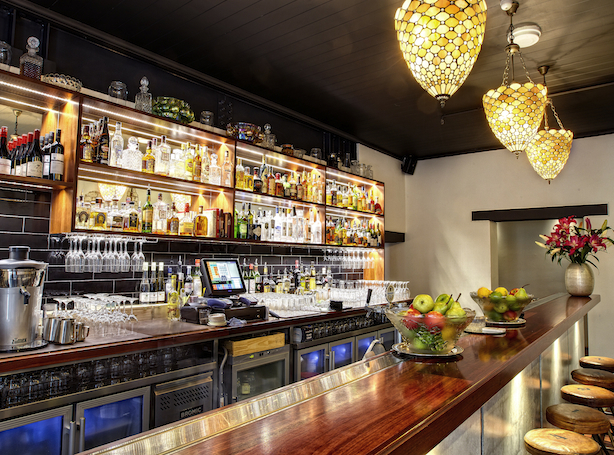 Bar Lafayette Perth is a Small Bar that focuses on client service & premium cocktails situated in Lower George’s Lane, Brookfield Place, Perth. This is the precinct at the base of the BHP Tower & Lafayette sits proudly next to Grill’d. 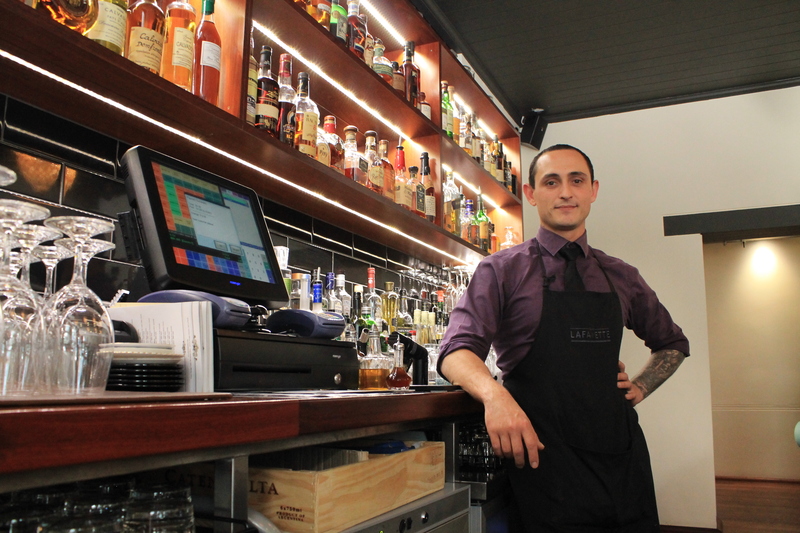 The Foodie Hub caught up with the Bar Manager & Co-Owner, Andrea Cardellini and received some excellent insights on Bar Lafayette’s vision, his career, & the some of the most popular cocktails available now at Bar Lafayette. Please tell us about your background, heritage & how you got into the Hospitality scene? I started bar-tending let us say, out of curiosity. I am from Italy, and studied at the Italian Association of Sommeliers (IAS). I studied there for eight months. I fell in love with the profession & decided to move to London in the UK. The plan was to stay there for six months, to gain some bar experience. The actual time I stayed there was 7 years! In London I really got a grasp for the art of bar-tending. I worked with two very reputable barmen, Tony Conigliaro at Shochu Lounge & Milo Rodriguez at Crazy Bear. The time at Crazy Bear saw me evolve into Head Bartender – a position I held for two years. I then moved onto Covent Garden Hotel where I was Bar Manager for 3 years. In London I met my fiance in the industry, and as she is from Perth I moved from London to Western Australia in 2010. In 2011 Rockpool opened it’s doors in Perth and I joined the team in Week 2. I worked behind the Bar at Rockpool for nearly 18 months and for the last few months of my tenure there I held the position of Bar Manager. I then met my business partners at Bar Lafayette through essentially a family link. We got talking and then planning and now we have what is Lafayette. What do you love about working behind the bar? Fundamental & above all else is people out to have a good time. I love being a part of that, to assist in providing that. The environment we foster at Bar Lafayette & the interaction we love with our customers is what I am very passionate about. It is always about the customer, what they want from the experience. I guess that stems from the hospitable Italian in me. What are your all time top three cocktails? Americano, Classic Daiquiri & Old Fashioned. 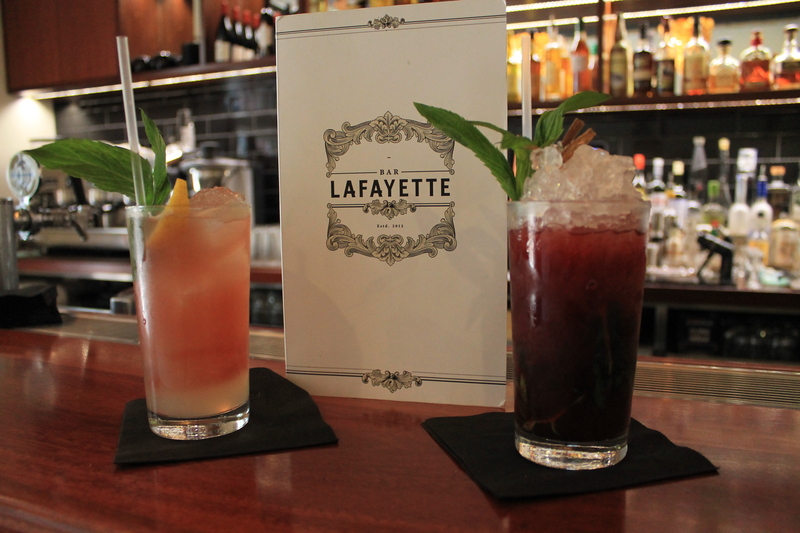 At Bar Lafayette, tell us about the most popular cocktails at the moment & what makes them stand out? 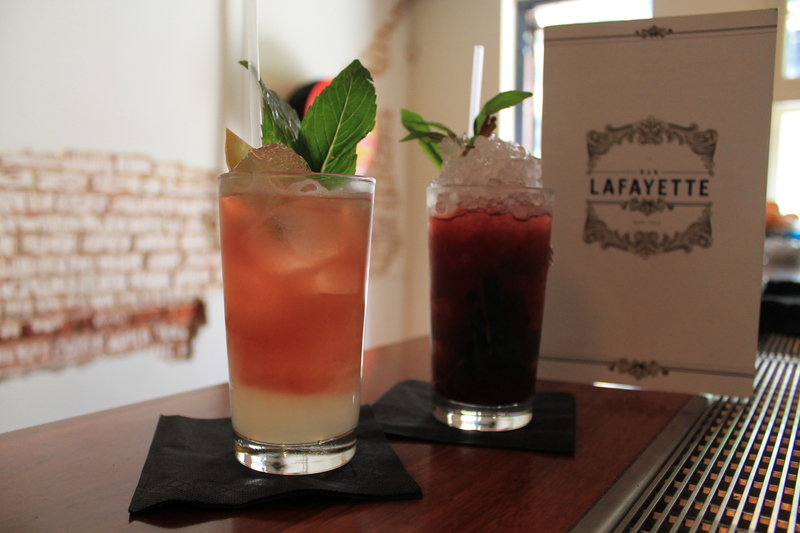 The Dark Berry Smash (pictured below right) & Lafayette’s Collins (pictured below left). They are two diverse cocktails that are both refreshing. The Dark Berry Smash is made with Fresh Mint & Citrus churned through crushed ice with dark berries. We then add Woodford Reserve & Lafayette Berry Liquer balanced with Bitters & Artisanal Spice Syrup. It is a Bourbon based twist on the Smash. Refreshing for the forthcoming hot summer months, its depth and warmth takes this cocktail to another level. Lafayette’s Collins is composed with Wyborowa Vodka & Lafayette’s Real Lemonade served long with a stain of Dubonnet. Essentially Vodka with homemade Citrusade, we make it in house. Lime, Lemon & Lemongrass. Its flavour profile is enhanced by the Dubonnet. It’s true you like to experiment with new flavours in cocktails- tell us your special cocktail of the moment that you enjoy making for the crowd & why? It’s more about the interaction. That’s where the emphasis is because our customers are always placed at the forefront. I like playing the question games, what do they like to drink, what do they feel like drinking, what cocktails would they like to experience in sequence. This is where a Bartender has more freedom than say a Chef. A Chef does not have the same opportunity of being able to interact face to face with customers. We can do this and it allows us to have a greater freedom of expression. 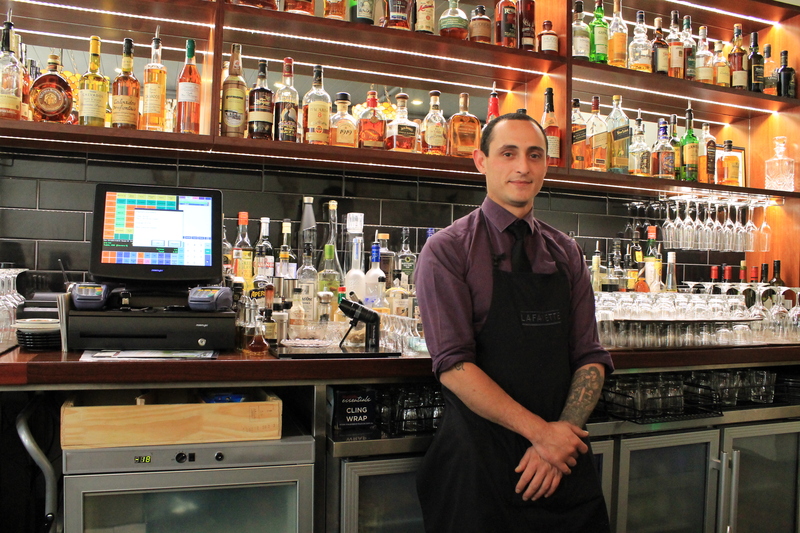 How does Bar Lafayette set itself apart & what does it focus on as its competitive advantage? Simply service & quality products. We use only the finest, premium & fresh ingredients. I mentioned we make our own Citrusade in house, we also make our own Coffee Liquer, Bitters, Syrups, Blackberry Liquer, Limencello & more to follow. We opened Bar Lafayette and operate under a Small Bar Licence. This enables us to host up to 120 patrons. Although the size of our venue could fit more than that in provided we had applied for an alternate licence, we specifically opted for the Small Bar licence. Given what we feel is a generous size for up to 120 people, we feel it is a statement that Bar Lafayette values personal space & offers this to our customers so they don’t have to worry about being squashed in to a venue. Finally, what do you see as the future of the Perth Small Bar scene and what sort of special events or nights do Lafayette currently or plan to host? Can certainly see several more Bars opening in Perth. I think with time, we shall see what happens to them. I do believe that by 2017-2022 you will see some of the Small Bars get ticked off the scene long term. By that I mean they will shut down, they will not be sustainable. We currently have a solo Acoustic sessions each Thursday night. The singer is seated outside in the Courtyard and not only is a popular weekly event, it is also a pleasant backdrop for some great cocktails and fun times here at Bar Lafayette.